THE Ayrshire Business Summit, held in the Park Hotel in Kilmarnock on Tuesday 24 March 2009 has been hailed as a very successful event, attracting an attendance of more than 120 businesses across Ayrshire. Organised by the Ayrshire Employment Task Force, the aim of the Business Summit was to provide a wide range of information for local businesses about the various forms of assistance and advice which is available to them to sustain and grow their businesses during the current economic and trading difficulties. Recognising the success of this Business Summit, the Ayrshire Employment Task Force is now developing proposals to hold a series of other events throughout Ayrshire. In the meantime, businesses which were unable to attend the Business Summit or those who wish further information are invited to make initial contact with their local Business Gateway Office. The Ayrshire Employment Task Force also wishes to express gratitude to the Park Hotel in Kilmarnock for their generous sponsorship of this event. The Ayrshire Employment Task Force has recently been formed with the remit to gather and share information about companies which are experiencing particular trading difficulties and to ensure that effective, co-ordinated support is made available to sustain the businesses and support the employees affected. Established initially within East Ayrshire, the Employment Task Force has now been extended to cover both North Ayrshire and South Ayrshire. 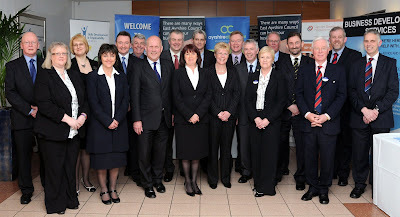 In addition to the three Councils, members of the Task Force include JobcentrePlus, Scottish Enterprise, Business Gateway, Ayrshire Chamber, the Federation of Small Businesses and Kilmarnock College. There are currently 487 Ayrshire business stories permanently archived on this site. To locate those of most interest to you, please use the site search facility in the top left hand corner of this page. Type your search term in the white box, then click “SEARCH BLOG”.